You can carry out smart balloon practices by following these tips. • Keep balloons secured to a weight. All helium-filled balloons should be tied securely to a weight that will keep them from releasing into the air; be sure to individually tie each balloon to the weight, so if they become detached from the weight, they will be individual rather than “clustered” (tied together) balloons which can more easily become entangled in power lines. • Do not release foil balloons into the air. Although it is very rare, they can cause problems if they are tangled in power lines and can turn into roadside litter if not disposed of properly. 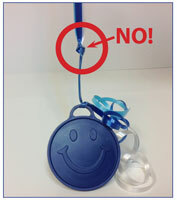 • Keep deflated or popped latex balloons away from small children to avoid risks of choking. Children can choke or suffocate on uninflated or broken balloons; adults should always supervise young children —especially those under 8 years-old—with balloons. • Although it rarely occurs, some people are known to have a “latex allergy.” Talk to your customers to find out if this pertains to them or the person to whom they will be giving the balloons and educate them about how they can still purchase balloons and not be affected. Latex balloons are made of natural rubber latex and are biodegradable, but may cause allergic reactions in people who are allergic to natural rubber latex. By tying the ribbons directly onto the weight, this will ensure that if the ribbons come loose or get cut they will disperse separately and have less of a chance getting tangled in power lines. Do not tie ribbons in a knot and then tie to the weight. This will keep the ribbons and balloons clustered together, making it more likely to get tangled in power lines. Please register as a Smart Balloon Retailer with The Balloon Council. Download this entire web page. Smart Balloon Practices is an educational program of The Balloon Council.